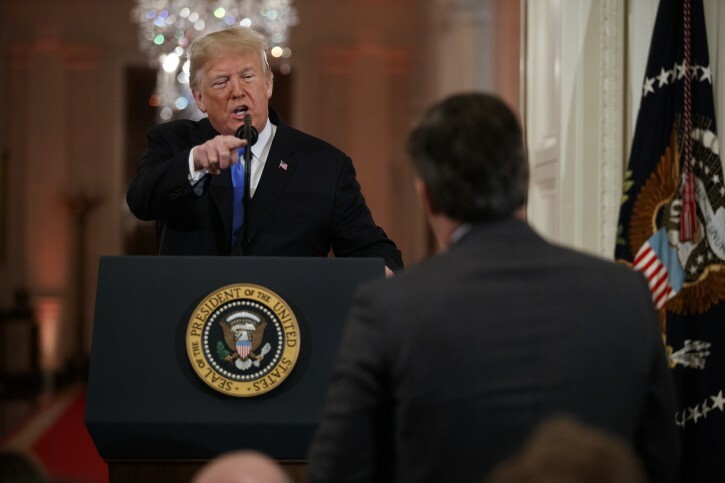 Washington - The White House on Wednesday suspended the press pass of CNN correspondent Jim Acosta after he and President Donald Trump had a heated confrontation during a news conference. They began sparring after Acosta asked Trump about the caravan of migrants heading from Latin America to the southern U.S. border. When Acosta tried to follow up with another question, Trump said, “That’s enough!” and a female White House aide unsuccessfully tried to grab the microphone from Acosta. The interaction between Acosta and the intern was brief, and Acosta appeared to brush her arm as she reached for the microphone and he tried to hold onto it. “Pardon me, ma’am,” he told her. Journalists assigned to cover the White House apply for passes that allow them daily access to press areas in the West Wing. White House staff decide whether journalists are eligible, though the Secret Service determines whether their applications are approved. The post-midterm election news conference marked a new low in the president’s relationship with journalists. “It’s such a hostile media,” Trump said after ordering reporter April Ryan of the American Urban Radio Networks to sit down when she tried to ask him a question. His exchanges with CNN’s Acosta and NBC News’ Peter Alexander turned bitterly personal, unusual even for a forum where the nature of their jobs often put presidents and the press at odds. “I came in here as a nice person wanting to answer questions, and I had people jumping out of their seats screaming questions at me,” said Trump, who talked for nearly 90 minutes despite the run-ins with reporters. Acosta asked Trump why the caravan of migrants was emphasized as an issue in the just-concluded midterm races. Acosta questioned Trump’s reference to the caravan as an invasion, and Trump defended the term. After Acosta asked about the investigation of Russia’s involvement in the 2016 election, Trump tried to turn to Alexander, but Acosta continued to ask questions. “I’m not a big fan of yours, either,” Trump replied. “I understand,” Alexander said, attempting to ask a question. Acosta stood back up and began mentioning, without a microphone, the explosive devices that were recently sent to CNN and some of the president’s political opponents. After the exchange, CNN, through its public relations department’s Twitter feed, said Trump’s attacks on the press have gone too far. Trump made several references in his news conference to how he feels mistreated by the press. He said he’s damned by the press for having either too few, too many or just the right amount of press availabilities. He turned specifically on reporter Yamiche Alcindor of PBS’ “NewsHour.” She said that “on the campaign trail, you called yourself a nationalist. Some people saw that as emboldening white nationalists.” Trump interrupted her, calling it a racist question. Trump talked about his supposed popularity with black Americans and said he’s more interested in advancing America’s interests than having a globalist point of view. Alcindor moved on to a different topic. Later, via Twitter, she said that she has interviewed white nationalists who say they are more excited by Trump than they have been about other presidents. “Even if President Trump doesn’t intend it, some see him as directly appealing to the racists,” she wrote. On CNN, anchor Jake Tapper said that there was nothing racist about her question and that Trump’s reaction was unfathomable. Trump told Ryan, of American Urban Radio Networks, repeatedly to sit down when she attempted to ask Trump about accusations of voter suppression. He said she was rude for interrupting another reporter, though he did briefly answer one of Ryan’s questions. Acosta should have been thrown out, a long time ago; also, the U.S. Secret Service was useless (as usual), as its Agents stood by, after Acosta shoved the White House intern. I saw a tape of him doing that. If the government does not approve of a journalist, it will act against him. Who does Acosta think he is, Bill Clinton?? Why is he putting his hands on an intern? Typical libtard. They make me sick. Acosta is disgrace, CNN is shameless. The whole dem-o-rats are a bunch of miserable mobsters. Lyin Paulin aka yamsar opens his fat lying mouth again . I wish you'd be pulled from vin . But here is the truth it's not about the tough question he asked . It's about assualting a female and mistreating her in public . It's called harassment . I watched the conference and was shocked . No one should tolerate work place harassment. The man who cries about Kavanaugh being accused falsely has no problem falsely accusing Acosta in order to shut down questions that he can't answer. Gutless. If Acosta had been a fox news reporter in Obama 's presidency and act as does with fighting off with his arm the white house intern, not only would he have lost his pass but would end up in jail as well. But we have 2 set of rules in this country as we all know so well. Farrakhan is the grand wizard for the left wing liberals. (He is no different from white supremacists) except skin color. They both believe the same thing . Yet almost every liberal (afro American) from Obama to maxin waters to bill Clinton all mer and embraced this true black nazi . Yrt the media is so quite abt this its truly sickening. And hypercritical. Even Ben Shapiro has called out Trump for lying. Not only should he be banned. The guy man-handled that lady. Can you imagine if a fox report did that. This guy a low life leftist phony media. CNN is sick. There you go lyin Paulin again . Tricky yoni repeating nonsense . It's not a false accusation. Watch the Confrence . It was assualt in public . It's on video genuis . And even the way he ignored a wh intern leaving aside the assault is mistreatment of women . And yes you can ask tough questions but no you should not be able to be chutzpahdik to tne president . You should be fired for that too . And verbal abuse to Sarah sanders is wrong too and fireable . If I did even a tenth of that to my boss at work I'd be fired . And to a woman I'd be sued . Facts are the guy assulated . It's on video genuis . During the press conference, the aide attempted to take a microphone away from Acosta as he questioned Trump, but he refused to let go. (The real, unedited) video shows his arm brushing hers in the process. This was video was edited (maybe by InfoWars) that Sanders shared zooms in on the moment of contact, and appears to have been sped up to make the moment appear more aggressive. Even Ben Shapiro ? Wow then it all must be true . Listen yoni seeing is believing . I saw the video . You can debate if that's called assault in legal terms but it was a nasty violent action connoted against an intern . Furthermore, yes this was just the horse that broke the camels back . His pass should have been revoked for a lack of behavior in the work place . If I behaved like that during my CEO townhall I'd be axed in a second . You can ask tough questions but you need to be respectful . And it's not just to the president but to sanders too . The web has this video posted in dozens of places, and anyone who wishes to view it can do so. I have no clue whether it was sped up or not, but he did consciously lay his hand on the intern to push her away. You might claim that when she was trying to take away the mike he reacted naturally, and did not intend to be aggressive. But he simply lied about that, too. Acosta has not behaved as a journalist should, and tries to push his agenda on the President. His credentials need to be revoked, and the WH is correct on this. CNN's baloney about free press is actually indicative of the agenda that sacrifices truth and fact for their hate for the president. Press credentials to enter the WH are not the exercise of free press. Permitting versus prohibiting publication of reports and editorials would be a free press issue. Acosta is conducting editorial tasks, lecturing the president, and exhibiting chutzpah. He has no business in the WH press room to do that. Can him.